Dogs don’t care if it is day or night. All they know is that they want to go outside for their walk. They will get very upset if they don’t get their daily walk. Everyone also knows that the only way to be safe at night is if you are seen. It is very difficult to see anything once it gets dark outside. Do you know that about 1.2 million dogs are killed annually while out for a walk. Most of these accidents occur after dark. You must take all the safety precautions you can to protect your four-legged friends. Of course you can carry a flashlight with you so that it is easier to be seen but that tends to get cumbersome when you are holding onto a leash as well. Squeaker has come up with dog collar lights that work great in helping your dog be seen after dark. Poochlight Dog Collars are quite ingenious. They have 2 LED lights on the collar, one on each end. There are two fiber optic strips that illuminate all the way around the collar. These collars can be seen up to 1 kilometer away. They come in a variety of sizes ranging from X-Small which is 23-35 cm to Large which is 49-61 cm. They are also adjustable. Note: The X-small only comes with one fiber optic strip because of the size. Squeaker has is a very interesting and eye catching website. They have an ongoing tweet that tells user when of their products is purchased. You have the option to chat live with someone on staff which makes it easier to get questions answered quickly. Squeaker is a new PetTech company that has offices in Melbourne and Los Angeles. They are a bunch of dog loving engineers and designers who just want to keep coming up with innovative ways to protect your pet. All of the products have been tested extensively in the wild Aussie Outback and have passed with flying colors. Squeaker Poochlight dog collars can help keep your dog safe when walking at night. They come in a variety of colors and are reasonably priced. The main goal is to make sure your pet is seen while outside in traffic and they definitely have accomplished that. Many have purchased these for their pet and enjoy a nice walk after dark, while knowing that your dog is as safe as he possibly can be. 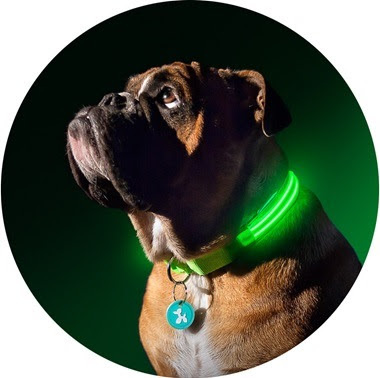 The collar and other light up accessories also help in protecting the dog owner as well.